The future once promised the certainty of a better life for all but now it is full of uncertainty, danger and fear. Our lives are surrounded by the threats, imaginary or real, posed by terrorist outrages, natural catastrophes and disasters of all kinds. The future is overshadowed by the nightmare of an outmoded humanity overwhelmed by a catastrophe of its own making, a kind of catastrophic grand finale that would mirror the original accident - the Big Bang - that some scientists believe created the universe. A biting meditation on Progress technoscientific progress, at any cost and without any limits this book defines the ways in which postindustrial science has merged with out-and-out hyperterrorism to threaten the foundations of Greco-Roman, Judeo-Christian civilization, and the future of the planet with them, through innovation of mass catastrophes that are part and parcel of its panoply of inventions. Urging us to face up to the consequences of our brave-new-world technologies, Virilio calls for the creation of a Museum of the Accident to fight our habituation to horror and violence, and our daily overexposure to terror, in the name, not of some preventive war, but of a preventive intelligence that would help us deal with both natural and artificial disasters. "Virilio's breakneck pattern-recognition method is apt to spark new thoughts in some readers' heads." Paul Virilio is one of the most original and provocative thinkers of the contemporary era. 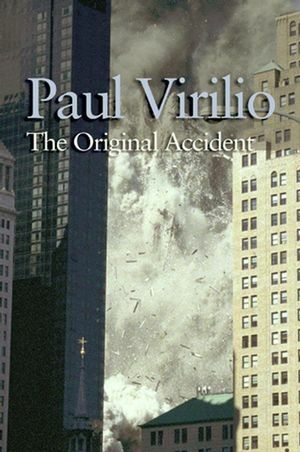 In The Original Accident Virilio continues his investigations of how the intensification of technological development and speed could provide the "accident of accidents", the catastrophic collapse of the global economy." This groundbreaking new book presents a biting meditation on techno-scientific progress at all costs and without restraint. Lucid and brilliantly argued, this book confronts a highly topical subject from an original and contemporary position. Virilio urges us to face up to the consequences of our brave-new-world technologies, calling for the creation of a Museum of the Accident to help create a preventive intelligence that would help us deal with both natural and artificial disasters.